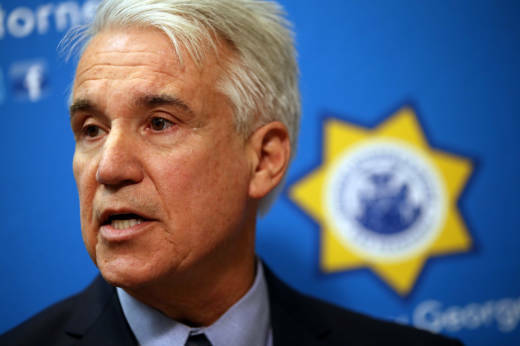 San Francisco District Attorney George Gascón, an early and vocal law enforcement champion of many of the reforms that have reshaped California's criminal justice system, will not run for re-election in 2019. Gascón made the surprise announcement in a lengthy statement Tuesday afternoon, citing his 90-year-old mother's ailing health. His decision dramatically alters the political landscape in a contest for San Francisco's top prosecutor that was shaping up to be the most contentious in years. Former prosecutor Suzy Loftus recently made her long-anticipated run for the seat official; lawyer Joseph Alioto Veronese and Deputy Attorney General Leif Dautch are also running. "The past eight years as your district attorney have been some of the most professionally rewarding years of my life," Gascón said in a written statement. "The job of district attorney is an enormous responsibility. It requires doing the right thing, even when it is unpopular, perhaps especially when it is unpopular. To do it well requires a serious commitment of time and energy." Gascón went on to credit the women in his life, saying they have made "countless sacrifices for my career." He cited his wife, Fabiola; his daughters; and his mother, whom he called a "true warrior who nourished my development and growth in every conceivable way." "I recognize that without these strong women in my life, and my late father, who gave up so much for me, I would not be a fraction of the man I am today," he stated. But, Gascón said, he realized as he prepared for a third run for office that his mother’s "weakened health weighed heavily on my mind." "She is 90 years old and has much greater needs than when I took office. I am her only child and have the responsibility to be there for her. It became clear that launching a re-election campaign would not be compatible with taking care of her adequately in this moment of need. As her son, I must meet that obligation. There is no acceptable alternative," he stated. Gascón, who was born in Cuba, is a former police officer who had never tried a case when he was named to the district attorney post in early 2011 by departing Mayor Gavin Newsom, who had previously recruited Gascón from Mesa, Arizona, to head San Francisco's troubled Police Department. Gascón was named district attorney when then-District Attorney Kamala Harris — now a U.S. senator — was elected California attorney general. Gascón was the city's first Latino district attorney and the first police chief in the nation to become a top prosecutor. Gascón, a former Republican who became a Democrat after moving to San Francisco, was well respected in criminal justice reform circles, but had a contentious relationship with some of the police department's rank and file, including its powerful union leadership. He also split with most of his district attorney counterparts in supporting a slew of ballot measures and legislative proposals that sought to end California's "tough on crime" laws in favor of a system more focused on rehabilitation. He was an early champion of Proposition 47, a ballot measure that reduced many drug possession charges from felonies to misdemeanors. Gascón also made national headlines earlier this year when he announced his office would proactively expunge old marijuana convictions, following the 2016 legalization of marijuana in California. He touted that decision in announcing he would not seek re-election. "Against the tide of nearly all prosecutors around the state, we also took the lead in proactively dismissing old marijuana convictions," he stated. "This leadership encouraged many DAs to join our effort and resulted in state legislation that will help people erase their old convictions, which will allow them to find employment and housing and improve their own lives and their community." Those close to Gascón said the decision not to run was made recently. "At this time, I simply cannot be the son I want to be and seek a third term," Gascón said in his statement. "My career means a great deal to me. But success in the world with a family in chaos is not a choice I am willing to make."